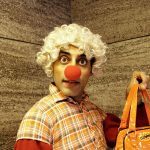 Wearing the ‘world’s smallest mask’ as Ashwath Bhatt, Theatre Garage Founder and Red Nose Clowning practitioner, calls the red nose is simultaneously very scary and liberating. 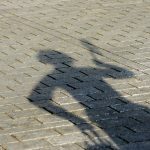 Scary because the inhibitions acquired over a lifetime prevent you from letting go but when one does take that step it is an extremely liberating and sometimes even a life changing experience. 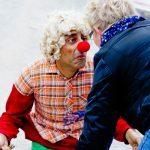 Civilized society teaches us from childhood to keep our emotions in control and to behave in a certain way in public. 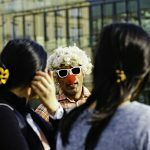 But as social animals emotions are what drive and define us and also form the bedrock of the relationships we build or break. 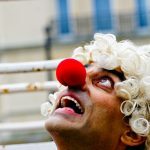 To not conform to those ‘expected norms’ always and remain repressed, to take us out of ourselves and make us comfortable expressing our basic emotions in public using imagination is what red nose clowning seeks to achieve. 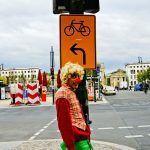 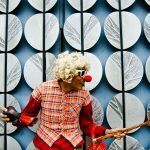 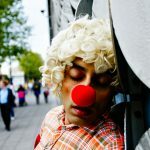 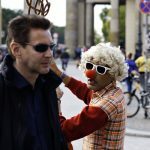 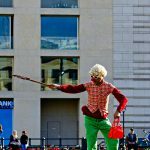 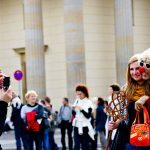 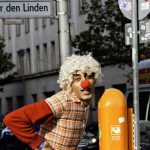 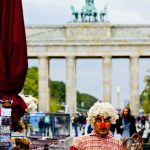 This photo essay captures the myriad fleeting emotions a clown portrays and evokes as he interacts with random strangers on the streets of Berlin one early October evening.